The Irish math rock sonic touchstones have steadily garnered more and more visibility in recent years, with bands like And So I Watch You From Afar and Enemies both having assembled impressive world audiences from their expert paradisaical soundscapes. There must be something in the water, as the Atlantic island has conjured enough aural palm trees to construct a second Disney World, and given their locale, one would be quick to assume that another batch of the locals, Former Monarchs, are additionally contributing to the cause. Though tropical math may be preeminent, the Cork band's debut full-length, The Cost of Living, seems more wont to construct the actual present, in all of its crooked glory, than pack up its bags and head for the beach. The Former Monarchs sound palette is both familiar and alluring to fans of the Ireland paradigm, despite its notable diversions. Knots, offered last year by nearby British neighbors Crash of Rhinos, is first to come to mind on the path of similarities, though The Cost of Living is a bit smoother around the edges. Where Crash of Rhinos finds solace in the intermingling of styles and genres, Former Monarchs have the propensity to spend the afternoon locked in a stylistic third gear, savoring every second of their classic twangy guitar tapping. Late-album star "Mori" is everything Minus The Bear would be today if they hadn't begun noncommittally flirting with the creepy "Touch me in the dark" sound. That being said, the Seattle rockers rarely have difficulty cultivating a strong relationship with the audience—something with which The Cost of Living often struggles. The anti-materialist "Buyer Beware" is certainly built upon good intentions, but feels more like a lecture than an honest look at crumbling human interaction. The venerable ethos within lines like "Now we are what we own / Philosophy has taken a backseat," which are already cloaked in a low vocal mix, is ultimately lost from a lack of anecdotal personality. "Battlelines," moreover, is jam-packed with as much empty rhetoric as the rich politicians its chastising. As lyricists Jonathan Pearson and Kevin Mulcahy work to force as many syllables as possible into rousing a crowd to a unified fist-pump, the issue at hand becomes more convoluted than engaging, more wordy than effective. Where Pearson and Mulcahy truly soar are on the more spacious, contemplative tracks. The margins of the lyric sheet to "Home" are significantly less crowded than many of its album neighbors, and the track consequently attracts more examination and intrigue thanks to its cryptic nature. "Home" additionally occupies somewhat of a black sheep moniker on The Cost of Living, in the sense that it forgoes an aural climax in favor of compositional stability—an unexpected success from the Cork band, that proves time and time again on The Cost of Living their seasoned fluency in contour and sonic accumulation. As if "Birdsong"'s inverted decibel approach of loud verses and restrained choruses wasn't striking enough, the cannonball blast of distortion hitting in the bridge handily claims one of the more memorable moments of the album. The aforementioned "Battlelines," despite its campy, overly syllabic introduction, offers some of the record's most stylistically interesting pieces. 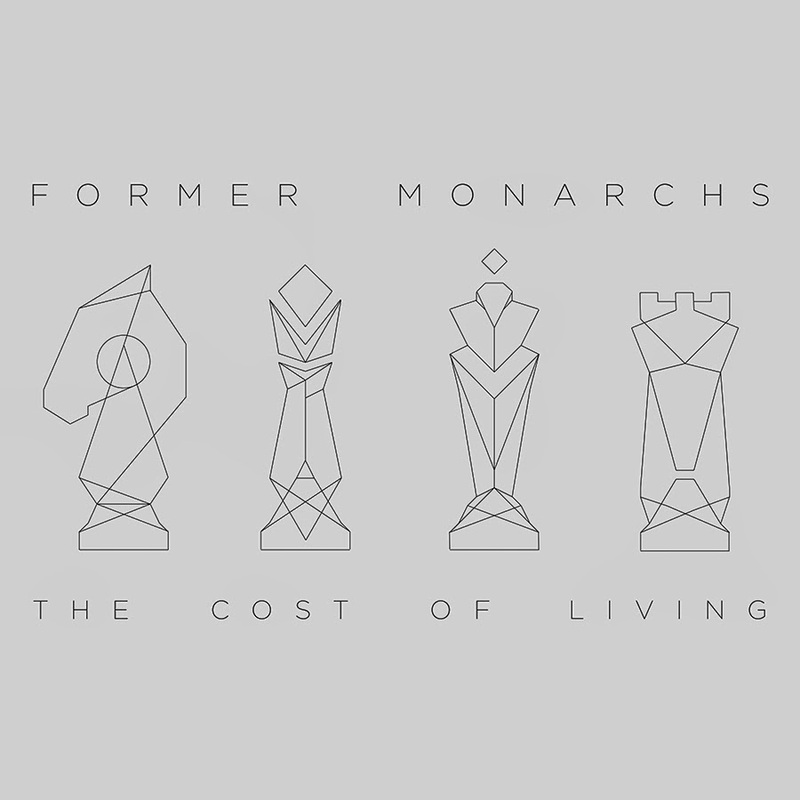 From a snowy Park-esque section to the triumphantly controlled concluding brass outro, it truly is remarkable how much Former Monarchs can accomplish in under four minutes, whilst still firmly remaining within the boundaries of twangy alternative rock. There are numerous gems to be found in the unlit corners of The Cost of Living, whether they be hidden in a subtle amplified swell, like in the already bombastic "Evade," or the oft unapparent structural meticulousness commanding much of the track list. Many of these pieces hit their cathartic peak during their instrumental bridges, and the veterans holding the pen know exactly when (and when not) to include that incorrectly assumed obligatory third chorus. Album opener "Origins" is easily the best representation of the Former Monarchs talent, as it's not until the bridge that the song really makes an impact, and the composition is so powerful at that point that Pearson and Mulcahy's quiet, but still rather insightful lyrics can't manage to divert the spotlight. Perhaps the vocals find themselves in the backseat because the music speaks for itself.